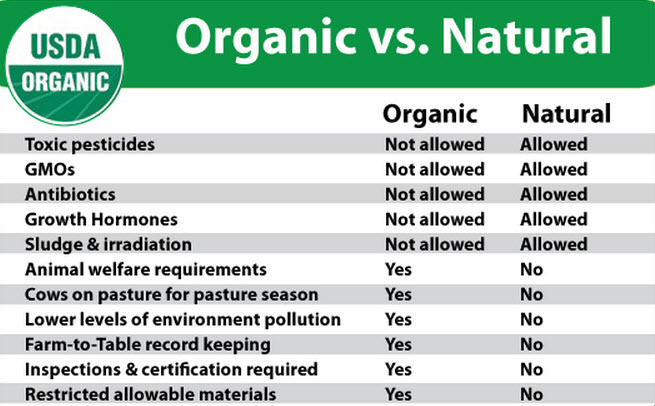 The National Organic Program officially began back in 2002 and anything that is currently labeled with an organic certification has met the criteria/standard that was set back then. Bearing the “organic” label assures you that your purchase lives up to a certain standard for top quality flavor, freshness, texture and variety because these foods are produced without the harmful chemical sprays that have been used on conventional agricultural products since the 1950’s. 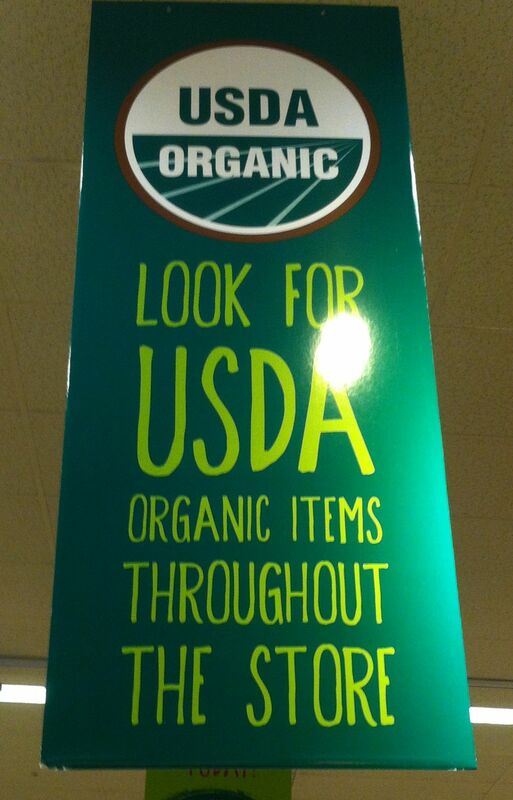 Organic also means the product must contain at least 95 percent organically produced and processed ingredients. Products with less than 70 percent organic ingredients cannot use the label organic. 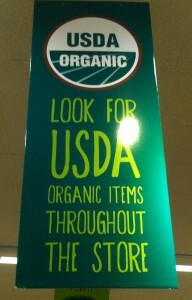 They can however list individual ingredients as being organic. The certification agency and each organic ingredient must be labeled on organic products. Natural products on the other hand are much tougher to figure out because the government does not regulate the word natural. This opens it to a world of interpretation. Where you are located, who the manufacturer is and what store you are dealing with will all play a role in how it is allowed to be used. Believe it or not, the FDA even approved “high-fructose” corn syrup as natural. Poultry and other meats that say “natural” on the label must provide an explanation as to how the product classifies itself as natural and they cannot contain artificial flavors, colors, sweeteners or preservatives. Nor does natural mean that the meat has been raised a certain way nor does it reflect on the feeding or care of the animal in any way. When choosing products that are listed as “natural” be sure and read the labels carefully and search for any processed or hidden artificial ingredients. Organic foods are strictly regulated and in a class by themselves and only foods that are raised and processed according to the Department of Agriculture’s organic criteria can be tagged and labeled organic. Terms such as “all natural,” “free-range” or “hormone-free” may seem tempting by definition but in reality, they do not, define “organic” foods. When organic appears on the label, you know you are buying food made without the use of toxic pesticides, damaging GMOs, artificial growth hormones, antibiotics, and without being irradiated. Organic products like fruits and vegetables are what usually comes to mind when people think about organic foods but this field is exploding and more and more products are offered daily. Pastas, frozen meals, frozen juices, sauces, soups, cookies, dairy, and even wine are all joining the “organic” party. This in turn helps to bring the price down as more and more large food markets sell these products in volume making organic foods more and more accessible to families. Isn’t it time you threw away all your old beliefs and definitions about dieting? Discover why your mindset and your body must be healthy first…“Rebound Free Weight Loss” provides you with all the tools you need to win the weight loss war forever.